Often all the talk is of larger cities when discussing advances in bicycle culture and infrastructure. Last month, at the Cycle Chic Bloggers Conference in Barcelona, we were all invited to a town 10 km from Barcelona called Saint Joan Despí. The Mayor of the town was keen to have us visit and Txell, from Barcelona Cycle Chic (and an ocean of other bicycle advocacy orgs) arranged for us to do so. Getting there was the first task and we decided to take the train. 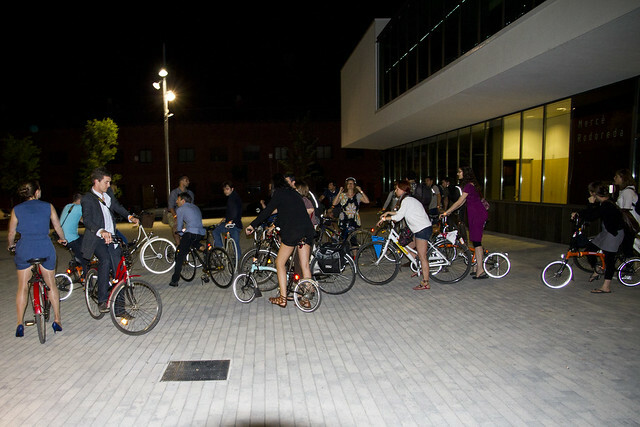 The first thought from this orderly Nordic mind was - can 22 people with bicycles get on one train?! Our Barcelonan friends just shrugged. Sure, why not? There is, of course, loads of room for bicycles on the train and even though we filled both compartments - and then some - nobody minded and everything went smoothly. We were greeted by the mayor at the train station in Saint Joan Despí, as well as a group of city officials and police. 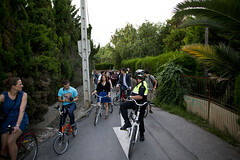 The bicycle tour of the city included detailed guided tours of the two masterpieces of the architect Josep Maria Jujol. Brilliant. Perfect for a Cycle Chic conference. Not all bike geek stuff but art and culture as well. 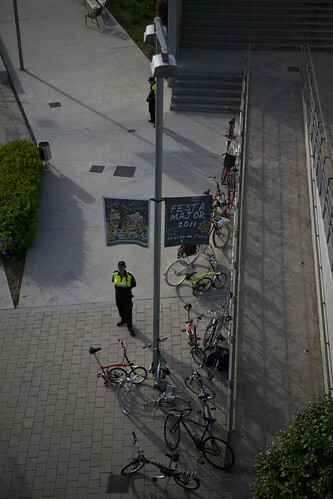 The police guarded our bikes for us. Nice. 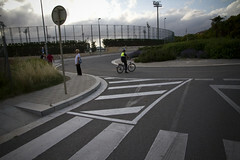 Another non-bicycle related highlight was visiting FC Barcelona's massive training centre in the town. 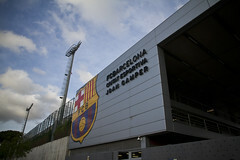 They play at Nou Camp, 4 km away, but this is where Barca trains each and every day. If just being there made me giggle, learning that there is no public access to the centre - it's guarded like a military installation - sent me over the moon. I kissed the grass accordingly and picked some of it to take home for my son - who keeps it in a metal box and places one blade in his goalkeeper gloves before each match. We toured the bike lanes - and there were many - and the Mayor was pleased to show us an example of the city's investment in bike lockers. 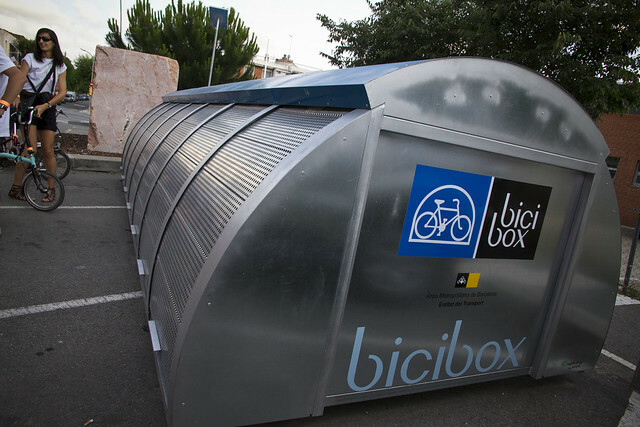 This is a town of 30,000 people and there are 14 bike lockers - each with space for either seven or fourteen bicycles. Joni from Dutch in Dublin blog and owner of Bear Bicycles watches as the Mayor demonstrates. Being a Cycle Chic Bloggers Conference, we were all well-dressed. But that's, of course, not possible. Riding a bicycle in the heat and on hills. Maybe we were a mirage. 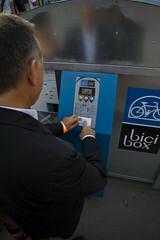 The bike locker system is a subscription system with works with a chip card. Very effective. I think it's about €30 a year. Imagine... some large cities don't even have that many bike lockers. The tour of the city ended up at the main library where we were treated to some lovely food and live music. The Mayor recieved a Cycle Chic t-shirt. In the photo (taken by the everpresent camera of the Hungarian Cycle Chic gang), Esther from the Catalonia Bicycle Club - BACC - just realised she had to translate it. The Mayor is cool and he accepted the gift - even after having it translated... he was still talking to me afterwards, so that was a good sign. 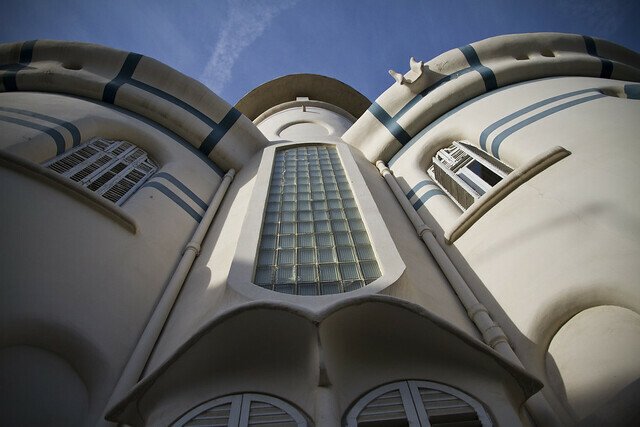 A brilliant trip to Saint Joan Despí. Thanks to the Mayor and his staff for making it so memorable for the Cycle Chic blogger crew. Bicycles, infrastructure, facilities, music, art, architecture, football. Couldn't have been better. And thanks, too, to BACC for all their help and great camaraderie. The time came to head back to Barcelona for a night out. We opted for the tram and, once again, I was amazed that nobody cared that we took up a bit more space than normal. 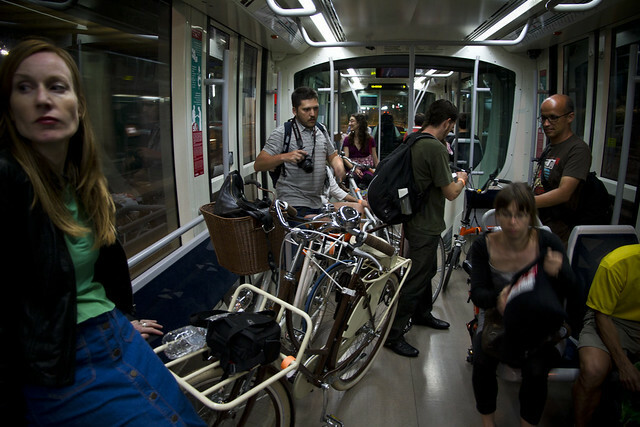 Taking bicycles on the trains and the trams is, also, free. 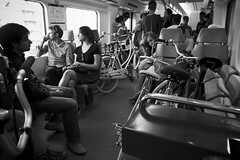 A ticket conductor came on board at one point but nothing about the bicycles was mentioned. He just deftly stepped around them without batting an eyelash. I could show you photos of how the night developed, but in some countries they somethinng called NSFW. 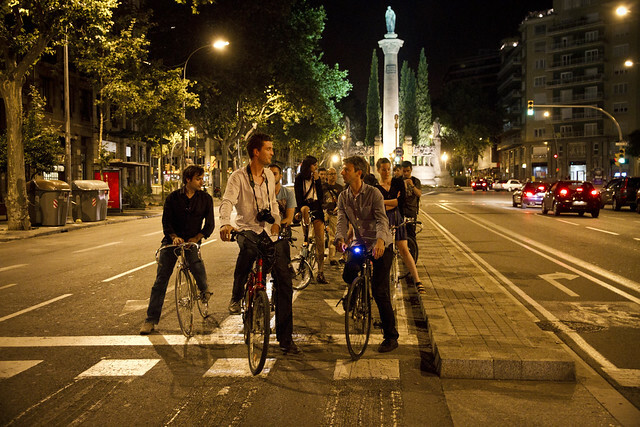 Bicycle culture in Catalonia is alive and well.